I love these layered rugs, but they look great together because of the floors. I ended up ditching my old rug for a cowhide very similar to this, I'll share photos later. Until I have the floors I want, I don't want to make a real investment rug purchase because it will only be compromised by the carpets, you know? i love this layered rug look. great idea!! I never thought about how the rugs will look different depending on what floors you have! I love this layered look as well! it never occurred to me to do this. Please tell me more about your experience with hides! They are beautiful but I've never been sure how clean they are? We have 2 cats and a dog so the thought of their dander and ever present fur getting trapped in there freaks me out. That's why I barely have a rug in my house, too hard to keep clean. Also, do you find hides shed at all? What if you were to spill something on it? Could you steam clean it, like you could a normal rug? Liz, I've found them to be incredibly durable, probably more so than any other kind of rug but I could be wrong. So far, we haven't had any major spills & we have no pets but if something does drop on it, I just wipe it off with a damp rag. That may not be the right way to do it but it's worked well so far. HI I was wondering what sort of camera you used to take photos. Thank you. I use a Canon EOS 40D with a 50 mm f/1.8 lens. I just discovered your blog last week and cracked out reading it for 2 days straight! Its definitely one of my favorites now. But what's under your carpets ? Is there anything that would look better with rugs on it than your current carpet underneath ? I love this combination of rugs. 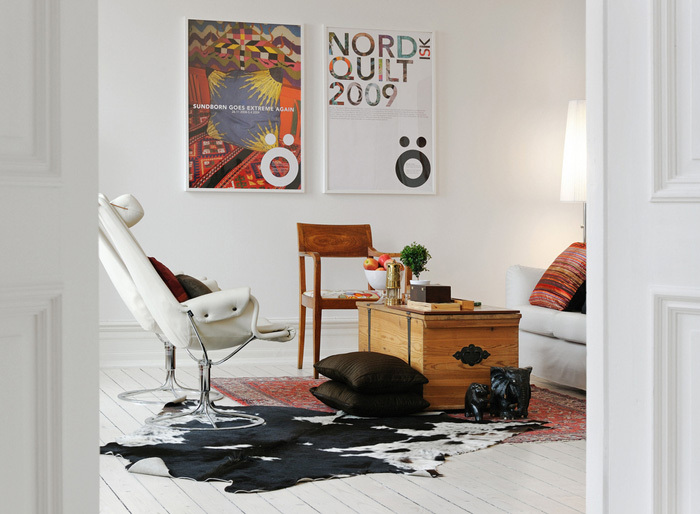 We already have dark brown/white cowhide rug, and I'm thinking of getting a kelim type rug as well.